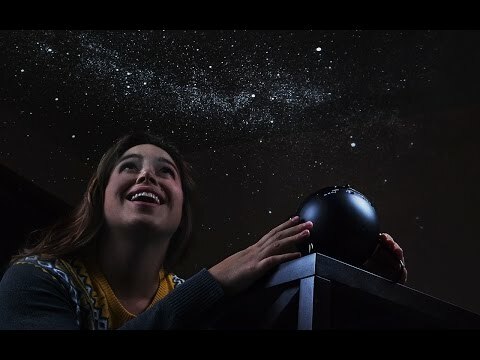 The night sky is brought into your home and projected with Homestar—a powerful home planetarium that uses the same technology as science museums. Create a gorgeous display of 60,000 stars, just for you. Homestar is incredibly realistic because it uses the most advanced lenses. 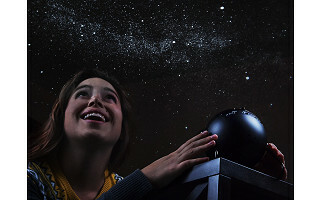 It comes from the brilliant mind of inventor Takayuki Ohira, who holds the world record for creating technology to show the most stars—over 20 million—with the Megastar Planetarium. Ohira wanted to bring that same universe into peoples’ homes, letting them finally see the countless stars that are masked by light pollution or that aren’t visible to the naked eye. The star-filled sky rotates in the same direction as the Earth, letting you study the Northern Hemisphere—you might even catch a shooting star, too. An integrated timer lets you drift off to sleep under the glowing landscape. Whether you use it as a soothing nightlight for the kids, or to create a calming ambiance for yourself, now the stars are always visible—no matter where you live. Hello everyone! I'm proud to introduce our Homestar Planetarium to The Grommet. You've probably never seen the night sky like this. I'd be happy to answer any questions you have! Whoa. This is really cool! Does it matter where I position the Homestar to see the projection? Hi Wallace, thanks for the kind words! Because the device is adjustable, the only thing that will fluctuate is where you actually project it. You will want to get it on a flat surface (wall or ceiling), but the position is something you can change depending on where you place it. You'll have plenty of versatility! @Mike will it work properly on a textured ceiling? @Raymond It is better to use a plain color ceiling, but with small textures, the stars will still be beautiful. @Ohira Does the projection become distorted on a flat ceiling? @Michael The disc is made in a way such that it is best for flat ceilings. Does this work/adjust for various heights/distances? For instance an 8ft ceiling, 10, 15, or 25ft ceiling..? Also, if one wanted to buy the Southern Hemisphere in addition to the kit, is that possible or will it be possible sometime in the future? @Janalea You get the best results with a projection distance of 59"-90". For bigger ceilings, you should put the Homestar on a chair, table or shelf. This is possible too, in future maybe even directly from The Grommet. @Ohira The lenses won't burn out and the light source is a LED with a fairly long lifetime. If they burn out, please let me know, we can fix it. I'm considering this as a Christmas gift for nieces and nephews in Northern Ireland while I'm in the US... and this may be a stupid question, but will i need any adapter etc. to plug in/and or use with in the UK, batteries? The video shows constellation outlines. Is this a selectable function? Is there one night sky image template that revolves around an axis or are there multiple seasonal templates? @Mark The Sega Toys Homestar comes with two discs. One with and one without the constellations. You can take them out and switch them. When looking at the sky, you can see different parts of it at different times of the day and at different months of the year. The Homestar comes with the same rotation function as the natural sky. But as you might not have time to wait 24 hours for one revolution, it goes a bit faster and revolves over a couple of minutes, but still very slow as in nature. @Mark No, there are no names being projected. However, there is a slide with the constellations. With this slide, you can easily find the stars. You can use any sky map from the internet look up the names of the stars and constellations. Question: is this showing a snapshot of the sky at a given location or does it show the sky at my location, wherever I may be, and based on the current date at that location? If it is programmed for location and date, just how far into the future is it programmed for? @Michael The discs are suitable for all of the US, Canada and Europe between about 25 and 50°N (additional discs are available for the southern hemisphere). As you surely know, a different part of the sky is visible at different times of the day and the year. You can use the rotation function of the Homestar to see how it looks at a different time. @Dave This is not a problem. It won't cover the ceiling all the way to the edges. But you also won't be able to see all the edges at the same time. So just project to the center and lay right under it. It will feel like a real sky! @Dave I was one of the testers at Grommet and I also have a bigger ceiling for projection. As Ohira says, it is not an issue. By way of context (for my interest in the Homestar Planetarium), I am not super knowledgable about astronomy but I have spent a lot of time helping my three sons with school assignments in this area so I picked up a general appreciation for star gazing. It is something we do regularly up in Maine where the ambient artificial light is limited. 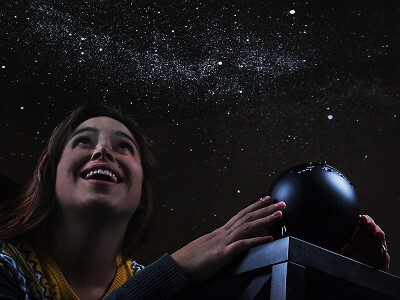 But we live in Boston so I was interested in the planetarium as a more year-round indoor solution to reproduce that awe-struck/relaxed sensation. The Homestar more than delivered. Does the Homestar support firmware/software updates ? @Franck This model does not come with integrated software. Therefore, there is no need for such updates. You can buy now and will be able to use forever as there is no software that will get outdated. Does this work on vaulted ceilings? @Hannah Yes, it does. But you should be as close as possible to the projector with your head in order to avoid distortion of the projected image. How big is the projection area,? will it cover more than say a 16 x 20 ceiling? Also you say there are 2 disks now what area of the sky do these represent and will there be more maybe in the future to buy. @Michael The projection area has a diameter of about 106". If your ceiling is bigger, it won't cover the whole ceiling, but you won't be able to see the whole ceiling at once either. Therefore just project the sky to the are you intend to be looking at. The discs are suitable for all of the US, Canada and Europe between about 25 and 50°N (additional discs are available for the southern hemisphere). Does the projection show the planets? @Eugene No, it only shows fixed stars. Planets move too fast and the discs would be outdated once you get them. does this get really hot when in use? @tari Sorry, if you are feeling cold in winter, you should invest in proper heating ;) This item has a high-conductivity plate to dissipate heat of the LED. The good cooling leads to a longer lifetime of the LED. For those of you heading home in the dark and for those with no plans tonight, in case your wishlist is currently empty, the shooting stars of the Geminids will give you enough chances to dream on with new wishes.